Noreen, S., Asgher, M., Hussain, F., and Iqbal, A. (2016). "Performance improvement of Ca-alginate bead cross-linked laccase from Trametes versicolor IBL-04," BioRes. 11(1), 558-572. Extracellular laccase was produced by Trametes versicolor IBL-04 using corn cobs as a substrate under pre-optimized culture conditions. A 64-kDa laccase enzyme was purified and immobilized on calcium alginate beads using glutaraldehyde as a cross-linking reagent. 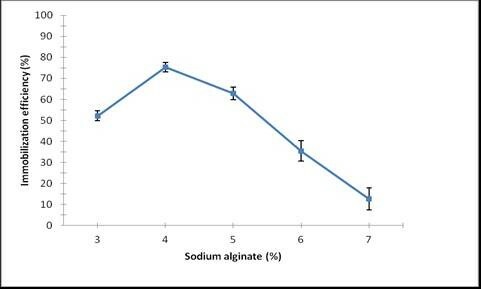 Maximum enzyme immobilization efficiency (89%) was observed with 2-mm calcium-alginate beads that were developed using 4% (w/v) sodium alginate in 2% (w/v) calcium chloride solution. Immobilization of laccase enhanced the optimum temperature but caused an acidic shift in the optimum pH of the enzyme. The immobilized enzyme showed optimum activity at pH 3.0 and 60 °C as compared to pH 4.5 and 45 °C for free laccase. 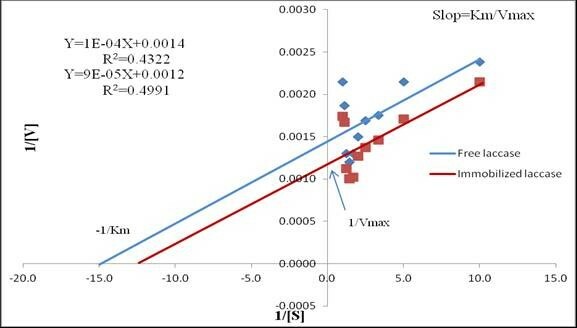 The kinetic constants Km and Vmax of laccase were significantly altered by immobilization. The affinity of enzyme toward its substrate increased (Km decreased), leading to enhanced catalytic efficiency (Vmax increased). Scanning electron microscopy (SEM) was performed to characterize the free and enzyme-bound immobilization matrix. Free and immobilized enzymes also were used for decolorization of the Reactive T Blue dye (030905 GWF) for three days. The free and immobilized laccases decolorized the dye by 65% and 92%, respectively, in 72 h. The immobilized enzyme retained 68% of its original activity after three cycles of repeated reuse for dye decolorization, indicating the usefulness of immobilized laccase in repeated industrial batch operations. Enzymes have gained increased significance in industrial and environmental biotechnology. Ligninolytic enzymes comprising lignin peroxidase (LiP), manganese peroxidase (MnP), and laccase have extensive applications in diverse industrial and bioremediation processes (Asgher et al. 2014). Trametes versicolor is an efficient producer of ligninolytic enzymes, especially MnP and laccase under appropriate culture conditions (Ferhan et al. 2012). Laccases are extensively dispersed enzymes in nature and are blue copper-containing efficient oxidases having less redox potential (Kurniawati and Nicell 2007; Shraddha et al. 2011). However, the industrial applications of laccases are hindered by their lower catalytic efficiencies and marginal operational stabilities under industrial process conditions. To improve their properties as industrial biocatalysts, it is mandatory to obtain laccases with enhanced operational stabilities. There are several strategies for developing efficient, stable, and recoverable enzymes including genetic engineering, chemical modifications of amino acid residues, and enzyme immobilization. Enzyme immobilization using different immobilization strategies and various immobilization supports seems to be the best strategy (Asgher et al. 2014). Using cross-linking immobilization, the development of inter- and intra-molecular cross-linkages between the enzyme molecules and immobilization support occurs by means of bi-functional reagents (Spahn and Minteer 2008). Covalent immobilization improves efficiency by using enzyme surfaces with amino groups. Entrapment in gels and beads is a preferred immobilization technique because the three-dimensional structure of the enzyme is not altered (Asgher et al. 2014). Recently, various immobilization supports for laccase immobilization have been used, including macroporous resins, Ca-alginate beads, nanoporous silica gel, polyacrylamide gel, and hydrophobic sol gels (Zhang et al. 2010). Entrapment in alginate beads is one of the most inexpensive, fast, and simplest method to develop efficient and stable laccase for degrading azo dyes and phenols in dye-containing water (Vishwakarma et al. 2012; Gonzalez et al. 2013; Mdaghri et al. 2013). This manuscript reports the results of a study carried out to immobilize extracellular laccase from Trametes versicolor IBL-04 onto Ca-alginate beads, which enhances its catalytic efficiency and storage stability over a wide range of pH and temperature. Laccase enzyme was produced from T. versicolor IBL-04 using corn cobs as a lignocellulosic growth substrate under pre-optimized solid state culture conditions (Asgher et al. 2012). The extracellular T. versicolor laccase was isolated by filtration and refrigerated after centrifugation at 13,000 rpm. The enzyme was purified by a four-step purification protocol, including ammonium sulfate precipitation, dialysis, ion-exchange chromatography, and gel filtration. Mass determination of laccase was done using the sodium dodecyl sulfate polyacrylamide gel electrophoresis (SDS-PAGE) method. Laccase was assayed by monitoring 2,2’-azino-bis(3-ethylbenzothiazoline-6- sulphonic (ABTS) acid oxidation in sodium malonate buffer at 420 nm (Wolfenden and Wilson 1982). Assay was performed in 2.1 mL of reaction mixture containing 1 mL of 50 mM malonate buffer (pH 4.5), 1 mL of ABTS and 0.1 mL of enzyme solution at 25 °C. The change in absorbance was monitored at 420 nm. The absorbance of each sample was measured after 10 min. The specific activity of the enzyme was determined as described by Asgher et al. (2012). Laccase was immobilized onto Ca-alginate beads by the previously reported method of Mdaghri et al. (2013) with minor modifications. The purified laccase was mixed with 3 to 7% sodium alginate with 50 mM sodium malonate buffer (pH 4.0) in 1:1:1 ratio. To this mixture, 0.1 mL of glutaraldehyde solution was added and mixed gently for 30 min at 4 °C. This was the first crosslinking reaction time. The resultant solution was added drop wise into 0.2 M CaCl2 (100 mL) solution using a syringe micropipette to form beads of uniform size. The beads were then transferred to fresh 0.2 M CaCl2 solution and incubated for 1 h at 4 °C. The Ca-alginate beads were then recovered by decanting and immersed in glutaraldehyde solution (0.02% v/v) for 2nd crosslinking reaction at 4 °C. After immobilization, the beads were washed several times with distilled water until the absorbance of the washings at 280 nm was less than 0.01. The enzyme containing beads were dried and stored at 4 °C for further studies. Scanning electron microscopy (SEM) of free and enzyme containing Ca-alginate beads was carried out to confirm the presence of laccase inside the Ca-alginate beads. The free and laccase containing Ca-alginate beads were dried by using a filter paper and then further oven-dried at 30 °C for 1 h. This assembly was preserved in a vacuum desiccator until the analysis. To determine the optimum pH for laccase, the free and immobilized enzymes were incubated in varying pH (pH 2 to 10) buffers for 1 h prior to performing the standard laccase assay. The buffers used in the study were (0.2 M): tartarate buffer, pH 3.0; sodium malonate buffer, pH 4.0; citrate phosphate, pH 5.0 and pH 6.0; sodium phosphate, pH 7.0 and pH 8.0; and carbonate-bicarbonate buffer, pH 9.0 and pH 10.0. The optimum temperature for free and Ca-alginate beads entrapped laccase was determined by incubating the enzymes at varying temperatures (30, 40, 50, 60, 70, 80, and 90 °C) for 1 h at optimal pH before running the routine laccase assay. Effect of substrate concentration on activities of free and immobilized laccases was studied by carrying out enzyme assays with varying concentrations of ABTS (5, 10, 15, 20, 25 mg/mL) in 50 mM sodium malonate buffer (pH 4.5). Lineweaver-Burk’s reciprocal plots were constructed between 1/S and 1/V0, and the kinetic parameters of Michaelis–Menten (Km and Vmax) were determined. Free and immobilized laccases were assayed at optimum pH and temperature. Thermal stability was assayed by incubating the free and immobilized laccase at optimum temperature for several times. Laccase efficiency was checked after every 60 min using the described enzyme assay. Immobilized laccase was stored in 50 mM sodium malonate buffer (pH 4.5) at 16 °C for 30 days, and enzyme activity was measured. To investigate the reusability of the immobilized enzyme, the used beads were filtered at the end of each cycle and washed three times with sodium malonate buffer to be used in the next fresh dye solutions. where Ao is the absorbance of the untreated dye and A is the absorbance after treatment with free/immobilized laccase. Laccase enzyme was produced by Trametes versicolor IBL-04 under previously optimized fermentation conditions (Asgher et al. 2012). The crude laccase activity was 911.11 U/mL, with a specific activity of 219 U/mg. Laccase was completely precipitated at an 80% ammonium sulfate saturation, giving a 2.29-fold purification. The enzyme purification was further increased to 3.09-fold with a specific activity of 677 U/mg after passage through a diethylaminoethyl (DEAE) cellulose ion exchange column. Specific activity increased to 833 U/mg after elution through a Sephadex G-100 gel filtration column resulting in 4.03-fold purification (Table 1) with more than 80% of other proteins removed. Mtui and Nakamura (2008) demonstrated that ammonium sulfate saturation in the range of 50% to 80% is suitable for isolation and recovery of ligninolytic enzymes. Freixo et al. (2008) and Aslam and Asgher (2011) also reported an 80% ammonium sulfate saturation point for laccase produced from various white rot fungi. In another study, Ganoderma sp. laccase was salted out at 70% saturation, having a 1.34-fold purification (Khammuang and Sarnthima 2009). Bead size is a major factor that influences enzyme immobilization efficiency. The maximum immobilization efficiency of 89.22% was observed with a 2-mm bead size. 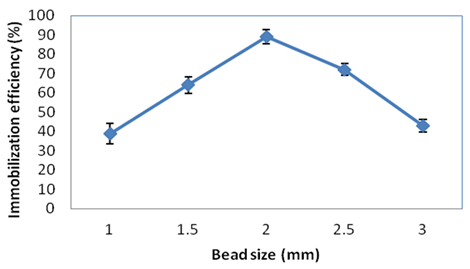 Larger bead sizes resulted in lower activity of the immobilized laccase. It was inferred that larger alginate bead size resulted in structural deformation or denaturation of the three-dimensional structure of enzyme during immobilization. Laccase was immobilized using varying concentrations (3% to 7% w/v) of sodium alginate, followed by the addition of CaCl2. Immobilization efficiency (%) was determined from the difference in enzyme activity in the solution before and after immobilization. Laccase immobilized in beads prepared from 4% Ca-alginate is shown in Fig. 2. The maximum (75.36%) laccase activity of immobilized laccase was observed for the 4% Ca-alginate solution (Fig. 3). As a matter of fact, sodium alginate and CaCl2 concentration are major parameters for enzyme entrapment in gel beads due to gel formation by cross-linking between alginate and Ca2+ ions. A higher sodium alginate concentration caused the immobilized laccase yield and efficiency to decrease, which might have been due to decreased gel porosity, high viscosity of enzyme entrapped beads, or substrate diffusion limitation (Kumar et al. 2012). It has been previously reported that 70% laccase activity was retained by Ca-alginate beads (Mdaghri et al. 2013). Mogharabi et al. (2012) also reported that 85% activity was retained after five successive cycles when the laccase enzyme was entrapped in Ca-alginate beads. Ca-alginate beads were also treated with varying concentrations of glutaraldehyde solution to assess the degree of enzyme immobilizationfollowed by coupling of enzyme to the active sites. 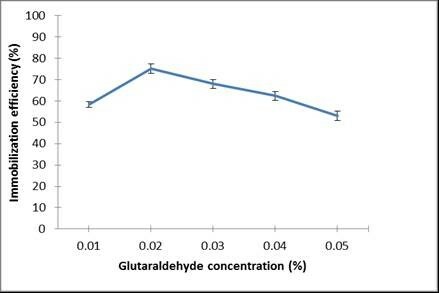 The highest laccase immobilization efficiency was achieved using 0.02% glutaraldehyde (Fig. 4). It was demonstrated that some aldehyde groups are generated on the surface of the glutaraldehyde (cross-linking agent)-treated alginate beads, which form Schiff bases with amino groups of enzymes, leading to enhanced immobilization efficiency. The external morphologies of dried beads were studied using SEM. Results shown in scanning electron micrographs of Ca-alginate bead surfaces without enzyme and bead surfaces with immobilized laccase (Fig. 5A, B, and C) demonstrated that the laccase enzyme was effectively immobilized on the surface of the calcium alginate beads because of the high surface area provided by beads. The surface morphologies of Ca-alginate beads varied with alginate concentration. The alginate concentration has more impact on loading efficiency and immobilization yield than CaCl2 concentration; therefore it is necessary to optimize alginate concentration to maximize the performance of entrapped enzymes (Won et al. 2005). The temperature-activity profiles of free and immobilized laccase showed 100% relative activities at 40 and 60 °C, respectively (Fig. 6). Immobilization causes improvement in thermal behavior of the enzymes as a result of the stabilization of the three-dimensional structures of protein enzymes. Free laccase readily lost its activity above 40 °C, whereas immobilized laccase showed a slow decline in its activity above 60 °C. The immobilized Trametes versicolor IBL-04 laccase was more thermally stable than Rhus laccase (Lu and Miyakoshi 2012), which was resistant only at 40 °C and was almost completely deactivated at 70 °C. 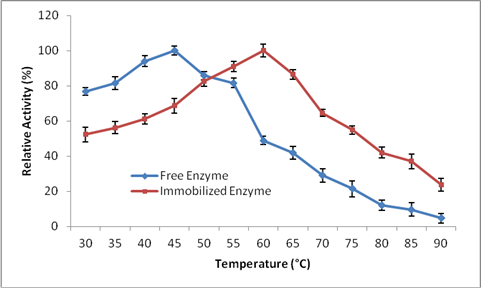 In a previous study, immobilized laccase showed thermostability at 80 °C, whereas the free enzyme was completely destroyed at this temperature (Mdaghri et al. 2013). 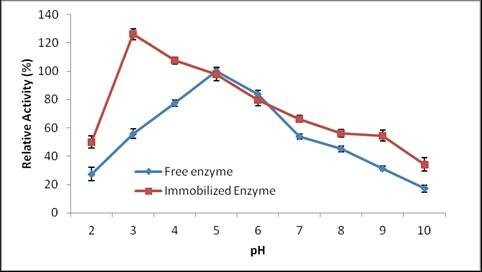 The immobilized laccase showed 100% relative activity at pH 3; the free enzyme that had an optimum pH of 5 (Fig. 7). This acidic pH shift is due to the H+ absorption capacity of charged supports like alginate. Similar to our results, Lu et al. (2007) reported the maximum activity of immobilized laccases in the pH range of 2.0 to 3.0. Asgher et al. (2012) also reported that after immobilization in sol gels, the optimum pH of laccase shifted toward the acidic range; this shift was due to the buffering effect of the carrier surface. Free and immobilized laccases of T. versicolor were shown to be the most active in a pH range of 4.0 to 5.0 and 2.0 to 4.0, respectively (Koroleva et al. 2002). Free and immobilized laccase showed different stability towards heat denaturation at optimized temperatures over various times (Fig. 8). After 6 h of incubation at 60 °C, Ca-alginate-immobilized laccase retained about 33.2% relative activity, whereas the free enzyme retained only 3.7% under the same conditions. This result indicated that laccase immobilization led to a significant stabilizing effect toward heat denaturation. Laccase stability is an important parameter for evaluating its viability in enzyme reuse and its application in long-term reactions (González et al. 2013).The enhanced thermal stability of laccase arising from immobilization would be an advantage for its industrial application because of the high temperatures used in industrial processes (Berrio et al. 2007). The thermal stability is one of the most important features for the application of the biocatalyst. Attachment of enzymes with a carrier support imparts structural stability against drastic conformational changes. In the present study, the immobilized laccase showed higher thermal stability towards heat denaturation as compared to its soluble counterpart. Km and Vmax values were calculated by intercepting the line on the X-axis and Y-axis of the reciprocal plot using ABTS as a substrate. 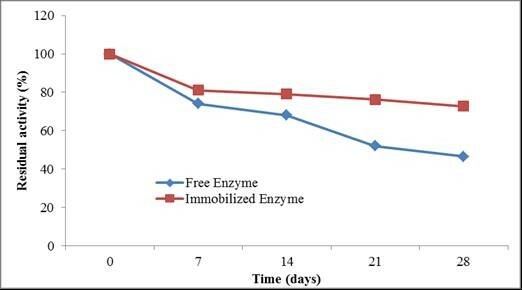 At an ABTS concentration of 0.7 mM, the maximum activity of free enzyme was 869.65 IU/mL, with a Km of 69.90 µM and Vmax of 720.7 µM/min; the maximum activity of the immobilized enzyme was 1003.31 IU/mL, with a Km of 77.5 µM and a Vmax of 876.4 µM/min using linear regression analysis. In earlier studies, several investigators reported that immobilized laccase had higher Km and Vmax than the free counterpart, yet immobilized laccase has been shown to have an appreciable catalytic efficiency, reusability, thermal stability, and equipped permanence because of a high Vmax (Fang et al. 2009; Qiu et al. 2009; Yamak et al. 2009; Bayramoglu et al. 2010a,b; Asgher et al. 2012). Conversely, Rekuc et al. (2009) and Makas et al. (2010) found lower KM and higher Kcat values for entrapped laccases from various white rot fungi. The difference in Km and Vmax values of laccases from different reported fungal species might be due to the genetic variations among various species. Immobilization may result in modification of some functional groups present on catalytic sites, as well as on the surface of ligninolytic enzymes, resulting in lower Km, enhanced catalytic efficiency, and increasing thermal stability (Asgher et al. 2014). Immobilization offered negligible diffusion of substrate and increased the capacity to capture a high concentration of product inside the Ca-alginate microspheres. However, it could be concluded that low substrate diffusion and hindrance of the conformational changes of the enzyme because of immobilization were the major causes of lower Km and higher Vmax. Furthermore, interaction of the enzyme with its substrate was indicated through its Km value: a low Km value indicates a high affinity of the enzyme for its substrate, and a high value of Vmax indicates that a small amount of enzyme can convert the substrate into the product (Asgher et al. 2014). Finally, we investigated whether the immobilized laccase could remain stable after storage at 16 °C. Laccase immobilized by Ca-alginate beads retained a higher residual activity (72.8%) than the free enzyme (46.5%) after 28 days (Fig. 10). This result demonstrates that the immobilized laccase showed better storage stability at 16 °C compared to free laccase. Reactive T. Blue dye (030905 GWF) decolorization by free and immobilized laccase showed that immobilized laccase was a more efficient dye decolorizer at 3 pH than free laccase. The best decolorization results (92%) were recorded after 72 h of incubation of the dye solution with immobilized enzyme at 37 °C (Fig. 11). The free and immobilized enzymes were used in six repeated batches for decolorization of Reactive T. Blue dye. It was noted that immobilized laccase retained 22.30% of its activity after six cycles of reuse, whereas the fee laccase lost almost 99% of its original activity (Table 2). Free laccase showed best dye decolorization at pH 4.5, whereas the immobilized laccase showed best decolorization at pH 3.0. Mostly, the textile industrial effluents have acidic pH and Ca-alginate beads immobilized laccase gave best decolorization result in acidic pH. In a previous study, immobilized laccase was found to decolorize textile dyes effectively in successive batch cultures (Peralta-Zamora et al. 2003). In another study, Vishwakarma et al. (2012) immobilized ligninolytic enzymes in Ca-alginate beads and up to 99% decolorization of azo dyes was noted with an incubation period of 18 h. Similar findings on the relationship between immobilized ligninolytic enzymes and textile dyes decolorization were also observed by Ramsay and Nguyen (2002). Trametes versicolor IBL-04 laccase immobilized in calcium alginate beads through entrapment immobilization, which enhanced the optimum temperature and decreased the optimum pH of the enzyme. The immobilized enzyme showed better kinetic, thermostability, and reusability properties. 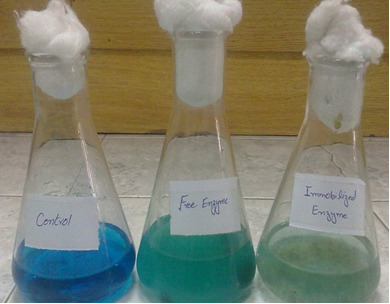 Immobilized enzyme was a superior, robust, and stable dye decolorizer, suggesting its effective and economic reusability in industrial batch operations. The authors are thankful to the Higher Education Commission, Islamabad, Pakistan, for providing funds for this research. The analytical facilities provided by the High Tech Lab, University of Agriculture, Faisalabad, are gratefully acknowledged. Gonzalez, J. C., Ascencio, A. P., Williamson, C. A. G., and Osma, J. F. (2013). “Laccase alginate encapsulation: Comparison between assisted and non-assisted extrusion for large-scale production,” Rev. Ingen. 39(1), 24-30. Mdaghri, A. S., Ghanam, J., Merzouki, M., Penninckx, M. J., and Benlemlih, M. (2013). “Immobilisation of Pycnoporus coccineus laccase in Ca alginate beads for use in the degradation of aromatic compounds present in olive oil mill wastewaters,” Biotechnol. Lett. 4(2), 91-94. Mtui, G., and Nakamura, Y. (2008). “Lignocellulosic enzymes from Flavodon flavus, a fungus isolated from Western Indian Ocean off the coast of Dar es Salaam, Tanzania,” Afr. J. Biotech. 7(17), 3066-3072. Ramsay, J. A., and Nguyen, T. (2002). “Decolourization of textile dyes by Trametes versicolor and its effect on dye toxicity,” Biotechnol. Lett. 24(21), 1757-1761. Spahn, C., and Minteer, S. D. (2008). “Enzyme immobilization in biotechnology,” Recent Patents Eng. 2(3), 195-200. Zhang, J., Yu, Y., Song, B., and Wang, C. (2010). “Purification and characterization of laccase from Curvularia trifold,” Adv. Mat. Res. 113(1), 2215-2219. Article submitted: April 2, 2015; Peer review completed: July 24, 2015; Revisions received and accepted: November 6, 2015; Published: November 24, 2015.